A hair oil ad shows two coconuts, one green in color and the other one in blue. And they say the one in green is the natural one and then showing their hair oil bottle in green, implicitly attacking the hair oil market leader Parachute which uses blue bottle. Now even getting the brand color right is not enough. 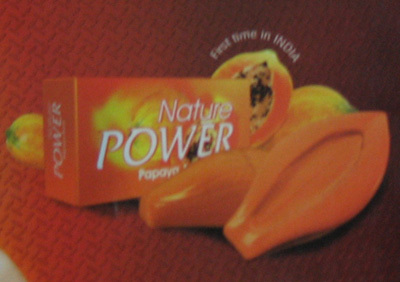 Power Soaps Limited has introduced Nature Power Papaya Aura, a soap shaped like a half-cut papaya. Yes, the soap not just has the color of papaya but also looks like one. It’s unique shape will definitely attract the consumers looking for newer choices. Another interesting thing to note. This designer soap is not introduced in the Indian market by FMCG majors HUL or ITC or Godrej; but by a relatively smaller regional player based in South India, Powersoaps Ltd. More creative power to the smaller companies!